One of the most common mistakes which people make when setting up their Google Apps email account on their iPhone is to choose the Gmail option instead of Microsoft Exchange. Gmail seems like the obvious choice however if you want full functionality like realtime calendar and contacts sync you’ll need to read on. Please note however that these instructions are for business subscribers to Google Apps only. If you are using a free Gmail account, these instructions won’t work for you. By setting up the account using the Google Apps Activesync Server address you will gain much more functionality. Step 1. Choose “Settings” icon from the iPhone’s main home screen. Step 2. Go to the Mail, Contacts, Calendars section of the main menu and click on the “Add Account” option. Step 3. 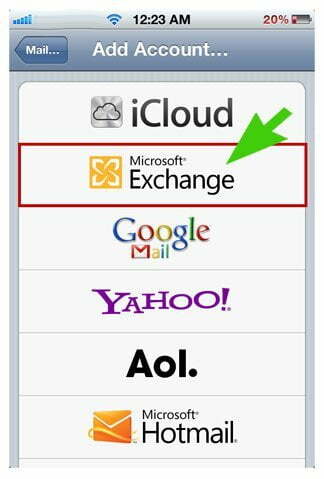 Choose “Microsoft Exchange” from the list of account types. (This article is written completely around this point. Get this bit wrong and it’s not going to work the way you want it to). Step 7. Move the sliders next to “Mail,” “Contacts” and “Calendars” to the “On” position. If prompted about existing data, choose “Keep on My iPhone” from the dialog box. Step 8. Tap the “Done” button in the upper right corner of the screen to complete the account setup process. Does this still work for Business Accounts? I have an Inbox and everything confirmed the settings were correct with a green checkmark – but there’s no messages in the inbox from the last few days.